Summary: A very detailed history, with tons of direct anecdotes, on the choppy relationship between Hollywood and the game industry. 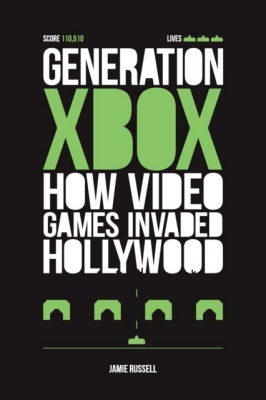 Generation Xbox: How Videogames Invaded Hollywood has a really unfortunate title that would normally make me dismiss it as sensational out-of-touch clickbait (…readingbait?). The truth is that while the author often makes enthusiastic and grandiose statements about the people and developments outlined in the book, it’s also a really excellent book that does justice to the topic at hand. If the intersection of film and games interests you, this book will serve you well. This is not a design book: it’s a pop-culture history book that largely focuses on the business deals and technology issues – and more rarely on the artistic intent – behind many well-known games based on films, films adaptations of games, and games that bridge “gameplay” and “cinema” to create various interactive experiences. It’s an easy read, obviously written to appeal to a popular audience of gamers, film buffs, and anyone in between. I think having some familiarity with the history of games is ideal, though not necessary. (I recommend reading The Ultimate History of Video Games first if you feel you need more background first). The book clocks in at around 330 pages, and each chapter is quite long (with some obvious breaks) and covers a really important topic related to film and games roughly in chronological order. Generation Xbox begins by discussing the situation leading up to Atari’s infamous E.T. game. Subsequent topics go into great detail on Dragon’s Lair, the FMV craze of the 90’s, George Lucas and Steven Spielberg’s involvement in games, the often disastrous film adaptations like Super Mario Bros and Mortal Kombat, the aborted Halo film, Heavy Rain and the advancements of motion capture that helped make the Avatar film possible. The author goes into a great deal of detail on many of these topics to make sure the reader has proper context (what the state of games or film were at the time) as well as including a wealth of insider information. I don’t think you can find this level of detail on many of the events outside of this book – for example, if you ever wanted to know exactly how the Super Mario Bros film got approved by Nintendo and how it ended up as a post-apocalyptic cyberpunk flick filmed in a warehouse, this book has you covered. Throughout the book there’s a sense that you’re just reading a series of train wrecks. Example after example shows potential wasted, squandered, or sabotaged by the competing interests of the film and game industries. The author proposes this miscommunication and failed attempts were often due to speaking different languages. Often film industry people who had the opportunity to collaborate with games just did not understand the nature of branching storylines and collaborate authorship with players, while games people didn’t understand the way film has a large hierarchy of people with competing demands (actors, producers, directors, etc.). The film industry tends to work off of celebrity, networking, and negotiation, while the game industry tends to be much more tech and engineer-focused, where results are king. I am not sure I entirely buy this argument, but there were enough anecdotes on the miscommunication between the industries from people involved in these deals that I can’t deny there was a cultural mismatch and a lot of people speaking past one another. Most of the problems highlighted in the book places blame largely on the film industry, and most of the interviews and stories come from the perspective of people in games rather than in film. I think that’s an important caveat to bring with you as you read it. Eventually Generation Xbox does end on a high note. After so many disasters and the rare success, it covers the technology behind motion capture that developed as games moved from 2D to 3D. This technology had immediate relevance in the film industry, and while it still took many years before mainstream actors were comfortable wearing spandex suits you can see how important those visual effects are in both film and games today. Personally I appreciated the FMV chapter best, since I remember playing many of the latter games from this era but didn’t know much about how they came about. This era showed a lot of experimentation that I feel we’ve largely forgotten, mainly because FMV acting was so, so terrible. I enjoyed seeing risky examples of the industries bringing game-like mechanics into movie theaters (Mr. Payback) and films onto consoles, even though all these attempts ultimately failed. I think it’s important to know about the history of our industry so I’ve seeded my game design book list with several popular nonfiction to help cover the gaps in my knowledge. Despite living in LA, the film industry is cloaked in the same mystique for me that the game industry had for those outside of it. Generation Xbox did a lot to demystify the evolving and often precarious business relationship between these two industries. Summary: A autobiographical recounting of Ralph Baer’s career, focusing on the Magnavox Odyssey and supported with a wealth of primary sources. Focused on engineering and business development rather than design. Ralph Baer passed away in December at the age of 92 and I bought his book almost immediately afterwards. I feel like I’ve always known his name, but never what he was known for – turns out, his greatest work was done before I was born. The forward to the book makes it clear that this is a common problem, that many people aren’t aware of Baer’s immense contribution to our field. The book covers Baer’s time in the game industry, heavily focusing on his role inventing videogames (with working prototypes as early as 1966!) 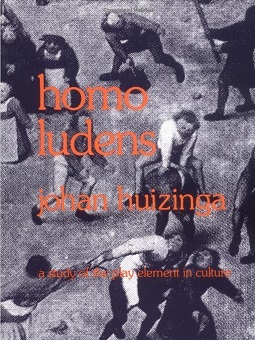 and ending with his own consulting work on electronic toys such as the ubiquitous four-colored “Simon”. He covers his long career at Sanders, a technology company that largely worked on defense contracts who saw his original tv game prototypes as leading, correctly, to military training simulations. He talks in great detail what it was like to invent new technology and pitch it to TV and cable companies in the hopes they would put it into production – starting with his “Brown Box” that became the Magnavox Odyssey but definitely not ending there. Baer provides a huge collection of primary sources displayed in their original state right in the pages of this book, and that alone is worth checking it out. Many of these design documents, schematics, contracts, focus testing feedback, photos, and original electronics exist thanks to meticulous record keeping and years of enforcing video game technology patents that Baer owned. He even includes all his video game patents in an appendix in the book if you would like to read them yourself. I was born after all these patents expired, so I wasn’t aware that Baer essentially owned the patent on “moving dots on a screen with player input” and similar mechanics that we just take for granted these days. This also explains a bit why Baer was a controversial figure in games, since patents aren’t looked too kindly upon by most game developers. In contrast, Baer encouraged and helped enforce his patents, since this is part of the ecosystem that gave him funding for his video games technology R&D department at Sander’s. (I think his habit of going to arcade conventions and writing down games that infringed on his patents to pass on to Magnavox lawyers would not endear him to many people today). 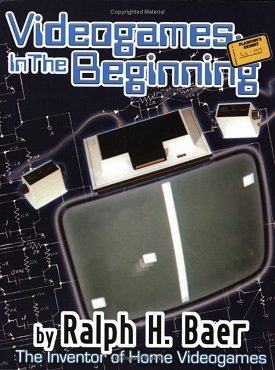 Videogames: In the Beginning is hard to review because it’s both an amazing, excellent source of early video game history while also being steeped in engineering terminology and a personality that might turn some people off. This book has a casual tone at times, as though Baer sat down with you, started “telling it like it is”, and not didn’t care if he talked poorly but candidly of other people in the industry. I felt this kind of direct, uncensored line to the author was rather refreshing. On the other hand, Baer was first and foremost a technologist and engineer. His writing is steeped in details about inventing not just concepts but also building the schematics and hardware. If the phrases “integrated circuit” or “vacuum tube” bother you then you might consider passing on this book, or just skim large parts of it. The first half of the book interested me enough to wade through all that engineering terminology since it covered the lead up and launch of Magnavox Odyssey. Unfortunately, it didn’t quite hold my fascination through the second half which involved a lot of miscellaneous video game inventions pitched – often unsuccessfully – to companies like Coleco, Atari, Mattel, and so on. As an introduction to early video game history, this book is narrowly focused on Baer’s own life and experiences and does not purport to give an overview of the subject. I would recommend reading more general history book like The Ultimate History of Video Games first before you do a deep dive into a single thread in that story in this text. I enjoyed Videogames: In the Beginning and I learned a lot from it, but only pick it up if the narrow subject matter is one you are particularly interested in.